Black America must continue to think about the ideological paradigm shift Malcolm ushered in during the 1960s that still holds some sway over a significant portion of those who are left-leaning organizers and social justice advocates. Enough sway that, even if not practiced by said leaders, it must be acknowledged as a touchstone of Black political thought. 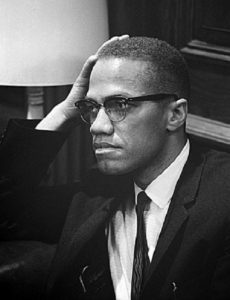 Through his organizing, speeches and posthumously published autobiography, Malcolm almost single-handedly re-popularized the ideas of self-sufficiency, self-determination and Black Nationalism. Malcolm X did not invent the concepts he espoused, those were learned from his parents as followers of Marcus Garvey, from his study in prison and, later, as the architect of the Nation of Islam’s growth under Elijah Muhammad. Malcolm practiced the art of creating power, not policy change. Creating institutions and organizations, cultural practices, agreements and governance in all areas of life. Financial, political, military, economic and social power was always Malcolm’s goal, even after he was forced out of the Nation. Malcolm, until his untimely death, attempted to create real community and society, ideas best suited to create the bonds of fraternity and the best path away from subjugation or exploitation from other groups, the very concepts that allowed the United States to exist and break away from its British brethren. The exploration of such models of self-determination has always been attempted in limited ways by Black people in America, both during and post-enslavement. The ideas of maroon societies, creating Black cities, Black Wall Street and such are an outgrowth not only of fighting racial oppression but also of building Black-controlled spaces for the development of Black people. The outcomes of these experiments were closely scrutinized by the dominant race and as Malcolm experienced himself, the experiments with creating power were terminated or marginalized via various methods when white people or the government institutions that protect the interest of some of those white people deemed those experiments dangerous or not in the best interest of the larger American project. It is through this exercise of fighting all attempts of Black advancement that the dominant society, through its liberal wing and institutions, settled on accepting an ideological model that inspired hope among Black people while offering pride among liberal whites that they were better than their conservative counterparts: The equality model. Except for the Garvey period in the early 1920s and an eight-year ascendancy of the Black Power movement from 1965 to about 1973, the dominant post-reconstruction theory of Black freedom in the United States has been based on an equality model. That model has certain pre-conditions that must be accepted by the minority group. The primary one is that the United States is innately moral and good and that any history of enslavement, genocide or militarism both here and abroad are aberrations and are not to be held up as the true character of the country. Once this “fact” is accepted, the minority group must then seek to reconcile its own existence in American society by accepting the inherent goodness of the majority population and the future hope that this goodness will pave the way for structural changes, allowing said minority to find its assimilated place within the culture and norms of the dominant group. The minority group must demonstrate through perseverance and persuasion that it deserves more rights and more access. The majority group once assured of its own physical and financial safety from the minority group may then allow more rights to the minority group on a trial basis. Those who qualify for the most additional societal rights are the leaders, who agree to practice the equality model to “open” this society up at a pace agreed upon. The equality model survives as the dominant theory of change within the United States because of several factors: The use of propaganda, the threat of violence, the use of violence and, most importantly today, the sharing of some resources and access to institutional players and positions. Propaganda is used effectively by the government and its leaders, the corporate media, civil society institutions, and arts and educational institutions to portray the United States as either infallible or just and righteous in its cause, whatever that cause may be. There is the acceptance of mistakes, but those are considered aberrations, including genocide and enslavement. The threat of violence as a system of control is constant. It is apparent in the number of people imprisoned, the institutions that surveil and the militarized nature of local law enforcement. The use of violence by the citizenry through ritualistic killings (lynching, church and home burnings, “stand your ground” killings and mass shootings) and the state criminal-justice apparatus (over-policing, extrajudicial police killings, discriminatory use of the death penalty) keep people scared of the possible consequences of government action. Lastly, giving Black intellectuals and thought leaders access to funding, media and elite institutions persuade those leaders that, when confronted with the bright line of U.S. racism, it is in their best interest to step away from the natural conclusion that white supremacy is systemic and equality is, therefore, unachievable. Instead, these leaders suggest everything is fixable through protest and policy change. The resources given by liberal white institutions may be well intended, but they are given usually with the reassurance that the equality model will be the primary lens used to suggest change, despite any “radical” language needed to rile up the base. The outcomes of this equality model continue to suggest that this equality, so long sought for, is no closer to being achieved than it ever was. From the continued disproportionate wealth gap to living conditions across racial lines, from educational gaps to the percentage of owners/leaders of almost every major U.S. institution, the idea that racial equality is an attainable goal is obliterated by almost any study you can find. Yet, those who struggle onward using the equality model keep plugging away. Is it that they can’t read the statistics? Are they blind to the election of a president who supports white supremacy attitudes and policies? Do they believe this is the only workable model? Or is it that, for those leaders, the access to positions and resources is too hard to resist? Some suggest that the soon-to-come demographic shifts that will reduce the population size of the white majority will give us more equality. However, the country of South Africa and every majority-Black city in the U.S. should serve as a stark reminder that mere population majorities don’t result in an equal sharing or redistribution of wealth, ownership or control.